I’m talking about a stack that rises on the nightstand to a ridiculous height. Okay, maybe we shouldn’t go there, either. Let’s try again. How about blog post headers piled atop one another to consume an entire in-box screen? Or the heap of unread New Yorkers on the floor beside my desk, a plight apparently shared by many and wittily described by Yuvi Zalkow on Writer Unboxed? It’s great to be part of a writing community. I enjoy going to readings, celebrating the launches of fellow writers’ books, and following writing blogs. But I’m reaching my saturation point. When am I supposed to find time to read all these great new titles my friends have published? Not to mention review unfinished manuscripts, edit the next edition of the CWC’s Fault Zone anthology (still time for non-members to enter the Fault Zone contest!) and maybe, oh maybe, read a novel just because it looks interesting? There is only one solution. I must ask my friends to stop writing. Kidding. Instead, I’ll continue to do my best to plow through the stacks, piles, and heaps. The dilemma of the expanding stacks has not only heightened my sympathy for the reader, it also has illustrated the importance of making my writing as compelling as possible. If a book is less than riveting, the reader can—and probably will—set it aside and move to the next one in the stack. Do you have enough time to read everything on your “to read” list? (That’s a rhetorical question, but feel free to answer.) How do you prioritize? If you’re a writer, do you find this problem overwhelming or motivating? I haven’t checked in about my ROW80 goals since early in the month when I finished my rough draft. Thankfully, the next round starts July 2, because I am in serious danger of running off the rails. Sitting down and cranking out words every day seems easy. The hard part is going back and figuring out what is working or not working. Do I need to completely change the structure of the book? Possibly. Where are the plot holes? Everywhere. Which of the characters need stronger motivation for their actions? All of them. But that work must be done. I’m looking forward to creating some measurable goals around those tasks and committing publicly to them for the next ROW80 round. I definitely do not have time to read every book, blog, and article I want to. I struggle to get to the blogs I like and show them love. I struggle with the piles of books waiting to be read. You are not alone. 🙂 I’ve bought so many books that I haven’t had time to read. But every once in a while I go on a reading binge and almost see light at the endless tunnel of books. I’m so happy you responded to my post more than a week after I wrote it, proving your assertion that I’m not alone in trying to keep up. Which reminds me, it’s about time to write another post :-). Overwhelmed! And that’s why I can’t read all of my fav blogs everyday. I follow only a few and read every other day, or sometimes just on weekends. I used to feel horrible about this, but it’s the best I can do and really read what I’m actually “reading,” if that makes sense. Yep, I’m with ya–that’s why I sometimes respond to posts that are more than a week old (ancient history in the blogosphere, I know). But really, we can’t do any more than our best. And I’m flattered to be among the ones you follow, read, and comment on! I recently had someone send me a really nice email to tell me they had unsubscribed from my blog because they didn’t have time to read it, and I found myself wondering what I could have done to make it more compelling so they found the time. But in light of what you’ve said, Audrey, I can totally sympathise with the overwhelmed blog-unsubscriber: I struggle to read all the blogs I’m so interested in, and when I do read them I often fail to leave a comment because I’m on to the next one. And books! Like you I want to read and support my fellow authors and friends, and even if a book isn’t my ‘cup of tea’ I usually feel compelled to keep going so I can give them an honest review. Kindle is your friend – I do a lot of my reading on Kindle and have a Kindle app on my smartphone. I find this comes in very handy for short bursts: waiting rooms, public transport and the like. Not always the most atmospheric but good for those ‘duty reads’. First of all, thanks so much for the mention. I’m sitting in a restaurant with my son who’s engrossed in his new magic book, so I check my email with my phone, see you have a new blog post, and click it open to read. And find my blog mentioned so nicely. So thank you. What a pleasant surprise. 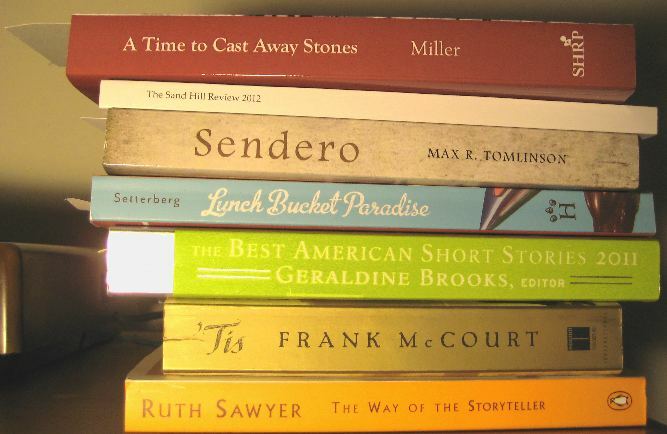 As for the reading list–frustrating, isn’t it? So many books, so little time. At any one time, I’m reading a book on writing technique, a non-fiction book to enlighten myself, and a fiction book for fun. In the latter category, I try to alternate between novels by a fellow blogger/online buddy and novels from some of my favorite traditionally published authors. Which means I make only a small dent in each every day. Oh, and then there are newspapers, magazines, and medical journals. No wonder I wear bifocal contacts! I think I mentioned before that your “blog voice” is infectious, and whenever I find it influencing me, I think of you! I like the “alternating” approach. I think I will adopt it; it will make me feel less as if I am favoring certain categories. Coincidentally, I just filled a prescription for progressive lenses for my new pair of glasses. Hope they work! As they say, “the first step is admitting you have a problem.” I spent the last year or so flipping my glasses up or staring under them to read labels, menus, etc. I think THAT screams “aging”! I’ve definitely grown more particular web it comes to what I read and finish… Great problem to have overall–too many books?!? It IS a great problem–thanks for keeping it in perspective! I’m thankful that we live in such a fruitful time and that so much reading material is available.